Friday October 28 1910 It was very cold. I got out my [fur?] cloak to work in afternoon. I cleaned a couple of closets and got dinner early. Will hauled 4 loads from town. I went down at 2.10 to stay with Mother while the girls both went to a party. Ott came up home a little while and read to me a new will Mother had made. I came home at 8.30. We read awhile and went to bed a letter from Lydia says [illegible] family are back from [Notch? ], Mo Saturday October 29 1910 Will hauled 4 loads from town again today and went down town after an early supper to get his shave. I did a big washing and ironing I fried [drywursts?] too I put away the clothes in the evening and put some things to rights. 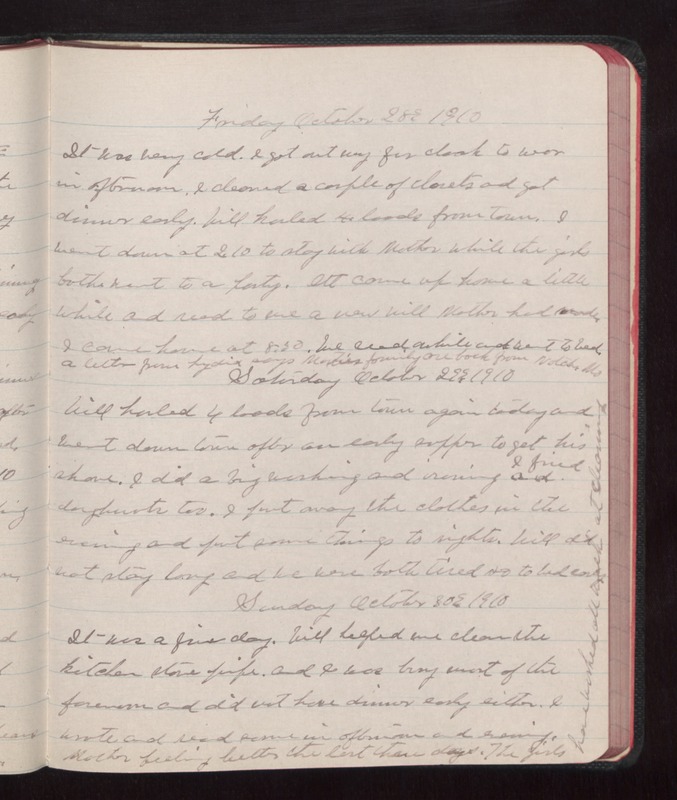 Will did not stay long and we were both tired so to bed early Sunday October 30 1910 It was a fine day. Will helped me clean the kitchen stove pipe. and I was busy most of the forenoon and did not have dinner early either. I wrote and read some in the afternoon and evening. Mother feeling better the last three days. The girls have worked all week at cleaning.